4.2 out of 5 based on 140 bloggers and 17 commenters. Visiting Card is a free premium blogger template adapted from WordPress with 1 column. I really like this template… I’ll add jQuery to this template! Thanks! I would LOVE to see something with more color and design (pretty). But otherwise I love this navigational template! Great job! I’m really happy that you love it! Cool – i take it! Solo una pregunta: Es posible mostrar las entradas, digamos en el menú tener un enlace a las entradas y que las muestre? No se si me explico, pero como esta el demo no muestra las entradas del blog, solo “paginas”. i just downloaded it. maybe i’ll just use in presentations, but its hot! even in its simplicity. Only i would have left off my space for sure and i would love to have seen added fan page and of course linked in place of last.fm and i would take of reddit and put in foursquare. Let me know if you have updates or variations. wow… Relly cool template. 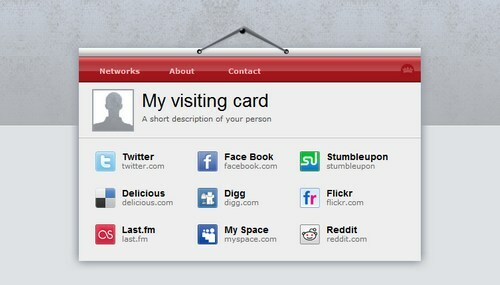 Specially social networks page and buttons. I love this template. A very creative work.Nice theme for blogger to the purpose of marketing.Thanks!! !